This equipment complies with FCC radiation exposure limits set forth for an uncontrolled environment. This equipment should be kept with minimum distance of 20 cm (7.87 in.) between the radiator (antenna) and your body at all times during adjustment. 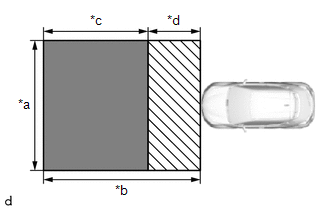 (a) Park the vehicle on a level surface where the area in front of the vehicle shown in the illustration is free of metal objects. Metal objects with a height of 50 mm (1.97 in.) or less placed within the area shown in the illustration will not affect the adjustment. (b) Check the levelness of the ground. (1) Check the levelness of the ground at the 3 points shown in the illustration. (2) Place the level on each levelness check point and check that the air bubble of the level is centered. (c) Adjust the tire inflation pressure to the specified pressure. (d) Clean the radiator grill garnish or millimeter wave radar sensor assembly. (e) Visually inspect the front of the vehicle. Confirm that there is no damage or deformation. (f) Check that the radiator grill garnish and millimeter wave radar sensor assembly is clean and there is no dirt or snow covering them. (g) Visually inspect the front bumper cover, radiator grille sub-assembly and stays. (a) Adjust SST (reflector) height. (1) Adjust SST (reflector) so that the center of SST (reflector) is the same height as the millimeter wave radar sensor assembly. Make sure to align the center of SST (reflector) with the millimeter wave radar sensor assembly (the center of the emblem). (1) Hang a weight with a pointed tip from the center of the tail gate handle, and mark the rear center point of the vehicle (point A) on the ground. Lightly flick the string with your fingers several times to confirm that the string is perpendicular to the ground. (2) Hang a weight with a pointed tip from the center of the radiator grille garnish, and mark the front center point of the vehicle (point B) on the ground (placement position). 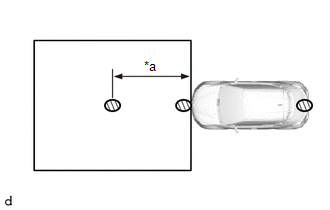 (3) Using tape and a string, create a line that connects point B to point A and extends at least 3000 mm (9.84 ft.) beyond the front center point of the vehicle. Make sure the string is taut when securing it with tape. Lightly flick the string with your fingers several times to confirm that the string is aligned with point B. (4) Mark point C (SST (reflector) placement position) at a position 3000 mm (9.84 ft.) from point B. (5) Place SST (reflector) at point C.
Close all of the doors. Ensure that nobody enters the adjustment area during the adjustment. Do not move or shake the vehicle during adjustment (do not get in or out of the vehicle). During the procedure, do not enter the adjustment area. Do not turn off the Techstream or ignition switch. (3) Turn the Techstream on and turn the cruise control system on using the cruise control main switch (ON/OFF button). (4) Enter the following menus: Body Electrical / Pre-Collision 2 / Utility / Front Beam Axis Adjustment. (5) According to the display on the Techstream, press "Next". (6) Perform the adjustment according to the display on the Techstream. If an error code is displayed, perform troubleshooting according to the following table, then perform the adjustment again. SST (reflector) is placed incorrectly. The radiator grille sub-assembly or millimeter wave radar sensor assembly is covered by dirt or snow. Clean the radiator grill garnish and radiator grille sub-assembly or millimeter wave radar sensor assembly. Dirt, snow or other obstruction is on the surface of the radiator grille sub-assembly or millimeter wave sensor assembly. Check and remove any dirt, snow or other obstruction on the surface of the radiator grille sub-assembly or millimeter wave sensor. There is a reflective object near SST (reflector). A person entered the adjustment area. SST (reflector) was moved out of position or shaking during the adjustment due to wind. Perform adjustment in an area with no wind. The beam axis of the millimeter wave radar sensor assembly is outside the automatic correction range. Check the condition of the millimeter wave radar sensor assembly. Check the condition of the sensor, radiator grille sub-assembly and front bumper cover. Check the installation condition of the front bumper cover and radiator grille sub-assembly. Operation of the millimeter wave radar sensor assembly is abnormal. There is dirt on the radiator grille sub-assembly or millimeter wave radar sensor assembly. Dirt, snow or other obstruction is on the surface of No. 1 radiator grill garnish or millimeter wave sensor assembly. The temperature around the millimeter wave radar sensor assembly is outside the operable range of the millimeter wave radar sensor assembly. Wait until the temperature drops to the operable range (-30 to 70°C). IG power source voltage is outside the operable range of the millimeter wave radar sensor assembly. Check the battery voltage (specified condition: 10 to 16 V). CAN communication between DSS and the millimeter wave radar sensor assembly is abnormal. Check the condition of the connectors. The beam axis of the millimeter wave radar sensor assembly is outside the automatic correction range (upward). Check the condition of the sensor and front bumper cover. Check the installation condition of the front bumper cover. The beam axis of the millimeter wave radar sensor assembly is outside the automatic correction range (downward). The vehicle is not stationary. Ensure that the vehicle remains stationary. A mode change error occurred. Operation of the yaw rate sensor is abnormal. *1: When millimeter wave radar sensor learning is in progress, clear the DTCs and perform beam axis alignment again. (7) Press the "Exit" button to finish front beam axis adjustment. (1) Enter the following menus: Body Electrical / Pre-Collision 2 / Utility / Front Beam Axis Misalignment Reading. (2) According to the display on the Techstream, press "Next". (3) Perform the adjustment according to the display on the Techstream. 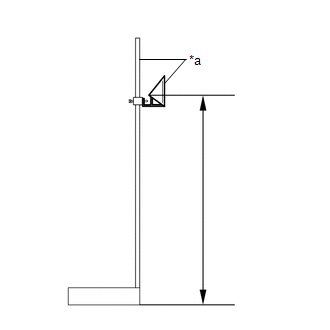 If the result is not as specified, perform beam axis adjustment again. (1) Enter the following menus: Body Electrical / Pre-Collision 2 / Utility / Front Beam Axis Offset Reading. (4) Turn the ignition switch off. (5) Disconnect the Techstream from the DLC3.